It seems impossible to believe that there would be any roles that women wouldn’t be capable of. But before the Second World War, it was seen as an impossibility of a woman taking a man’s job. But with the death toll mounting and the need for more male recruits; the need for women to step up become too great. Being in the Women’s Land Army was a truly unique experience, some undertook back breaking work but they also had independence that they never had before. If you have an ancestor or relative that was in the Women’s Land Army, you can proud of how hard they worked to help Australia through the war and how much they accomplished. Finding their records is hard work and an accomplishment too. Initially the Women’s Land Army started in Britain in the First World War. The ladies were hired to take over men’s positions in agricultural work. It was so successful that it was formed again for the Second World War. 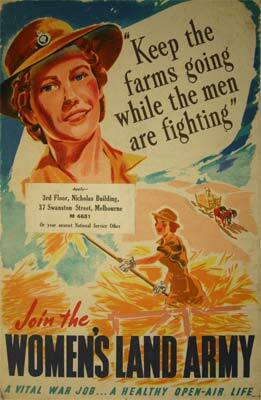 Australia started our own Women’s Land Army in World War Two after Japan entered the war. In July 1942, Land Armies started to be formed on a state basis. There were two types of workers – full-time (1 year contracts that were renewable) and auxiliary members (they would work for around 3 months for seasonal work). Women were between 18 to 50 years of age and were generally unskilled workers from the city. The Land Army finished in 1945 and from it’s beginning to end around 25,000 women had been through the training and worked for the Women’s Land Army. Before the end of the war, the Women’s Land Army was in the process of being recognised, however this never went through. This had meant that no pension, no service entitlements, no badges or recognition happened. It also meant that service records were deemed as unimportant. Books like “Thanks Girls and Goodbye” written by Sue Hardisty , that was based on the ABC program of the same name would give you a full sense of what the Women’s Land Army was about. We may focus on the men and the sacrifices that they had made for our country. But it doesn’t mean that the women left behind had it easy. Women were just as patriotic as their men and they worked hard to show that. I’m sure in some circumstances they worked harder than ever before to prove to others that they were capable. I think the Women’s Land Army gave society a real push towards gender equality. I am glad that the government is finally making a move to recognising their service. I also see that the Queen also honoured some Land Army girls with a royal tea, as their service is not recognised in the UK either. Also if you haven’t caught it, the “Land Army” is showing on Netflix. I hope if you have a land army girl, you get to have a good chat about their service as I’m sure it would have been quite an adventure. Last updated by Nicol Warren at September 8, 2015 . Thanks for putting my blog post in your Fab Finds.